I love it! I really like your deinocheirus as well! It really shows how Dinosaurs can be fun and stylized, while being accurate at the same time. In my opinion the more accurate and diverse dinosaurs are way cooler than the pop culture ones. I definitely agree with you; the diversity in what we know about dinosaurs now is amazing. 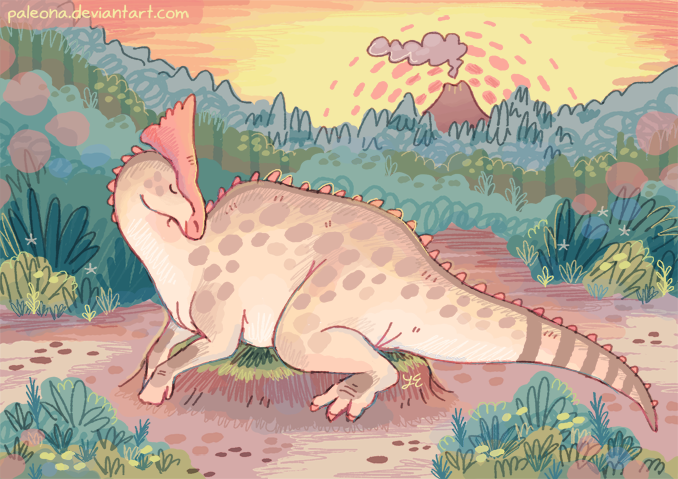 Drew another one of my favorite hadrosaurs! Thanks, Mamasaurus! Adding backgrounds is something I've sort of forced myself to do over the years, because I personally prefer art where the subject is in an environment, instead of just on a blank space. Absolutely love your style! So whimsical and they look like they belong in a children's book. I looked through your deviant art and absolutely love the sea-goat picture you did! Very nice art! and you made my dinosaur! Nice artwork, particularly the honking night time Hadrosaur. Well done. That parasaurolophus is gorgeous (always been one of my favs since they "sing" ). I never thought I'd want to hang a dinosaur on my wall, even though I love them. But I'd actually consider buying a print! Don't think my hubby would appreciate that too much, so it'll have to wait until I get a little art studio space for myself. Hehe, I just love how charming and heartwarming your work is. That's what I try to do in my illustrations, and your work is really inspiring. Kovu- glad you like the sea-goat pic; I really loved working with those beachy colors. @Paleona I really admire your style. You definitely should release a children's dinosaur book. As a graphic designer I would love to help you put it together. Send me a message if you're interested! Thanks for the kind words, kreativek. I'm not currently looking to publish my artwork, but I'm flattered, all the same! Hoping to do some more little dino pics soon. What do I have to do to get the chance to purchase a shirt with that wonderful Olorotitan on it? Actually, all of your hadrosaurs and stegosaurs are desperately needed. Your art is so colourful and whimsical and innocent and messy in all the right ways. 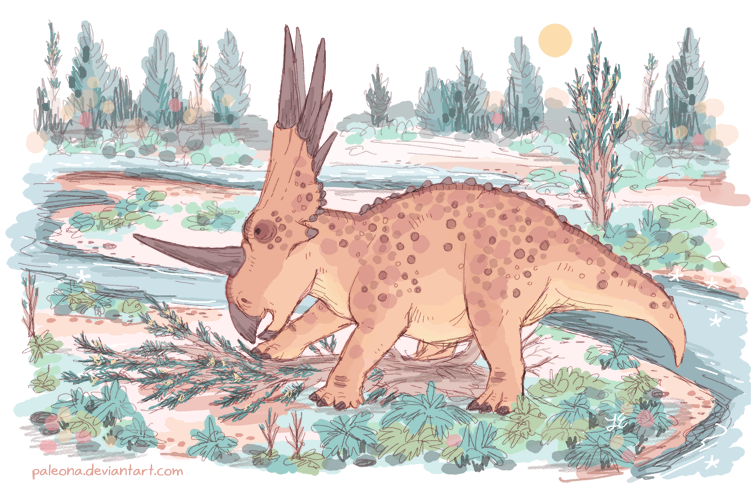 The Styracosaurus also looks great, you backgrounds are so full of suggested details, it´s really intriguing! Thanks so much~! I really love working more messy like this :') In a world where realism seems to be the dominant look for paleo-art, I'm happy people enjoy my more colorful dinosaurs! Ahh, sorry, I actually don't sell prints/merchandise! For me, art is my passion, not my job. I really like those ankylosaurs! Very peaceful looking, I like them! Thank you, Jose and ZoPteryx! 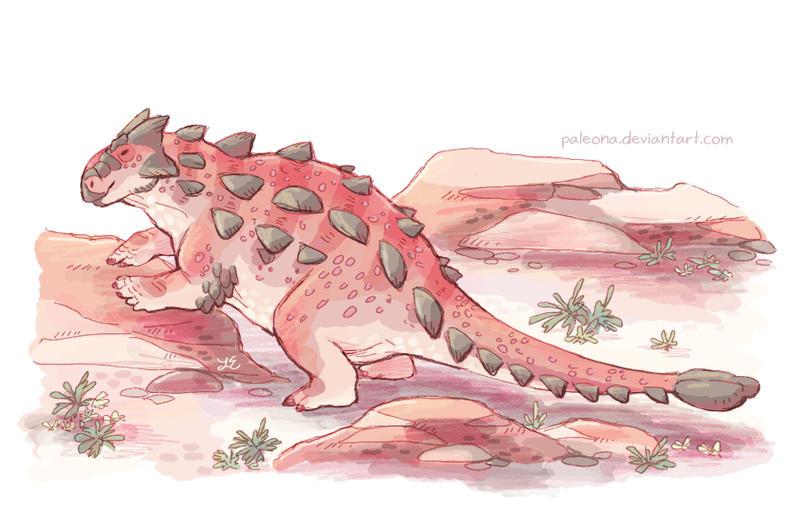 Ankylosaurs are quickly becoming my favorite family of dinosaurs!! 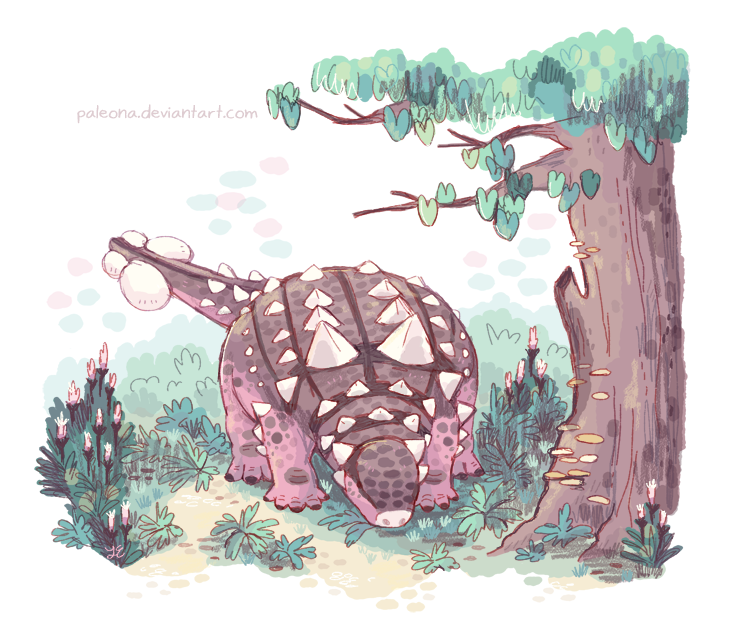 I never thought I'd say this about an Ankylosaur, but that Euoplocephalus is cute!